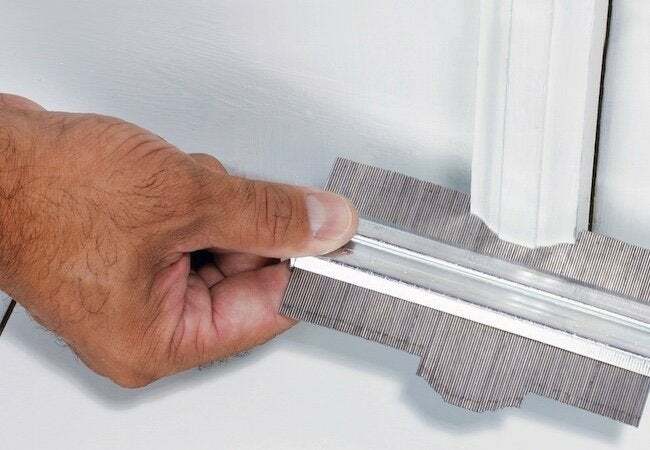 Recreate the precise shape of corners, edges, and curves on wood, tile, and other materials with a simple, low-tech tool that couldn't be easier to use. Learn more now. Cutting flooring or siding to fit around curved surfaces can be tricky, especially if you don’t have the right tool. In this case, what you need is a contour gauge. Contour gauges look a bit like a hair comb, but with teeth protruding from both sides of the handle. Rather than being fixed and stationary, those teeth slide smoothly through the handle, molding to the contour of whatever profile you set the gauge against. Using the tool is dead-simple. First, lightly press the teeth against a flat surface to make sure the ends are in line. Then nudge the gauge up against whatever shape you wish to duplicate. Once you’ve got it, lay the contour gauge onto the material you’re working with. Trace the shape dictatated by the teeth of the gauge, then make your cut with a jigsaw, bandsaw, or coping saw.